We can apply graphics using vinyl or digital printed vinyl. 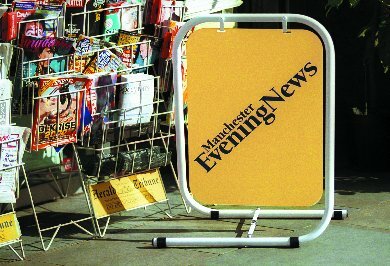 'The original and still the best' Swingsign is probably the world�s most successful pavement sign, combining light weight and portability within a stable frame that folds flat for economical storage and distribution. With no hinges or moving parts in the frame, this sign is built to stand the test of time. Manufactured from a corrosion resistant alloy, the display panel is subjected to a multi-stage automatic pre-treatment process prior to polyester powder coating to ensure maintenance free service. Re-usable hanging straps allow easy panel replacement for new messages.